If the TriMet board of directors approves, two Vintage Trolley cars will “clang, clang, clang” their way to the St. Louis Loop Trolley Transportation Development District. The opening line of “The Trolley Song” from the 1944 film Meet me in St. Louis helps set the stage for the cars to become part of a new heritage streetcar project in St. Louis called the Loop Trolley. The board will consider transferring them to St. Louis at its monthly meeting on Dec. 11. Vintage Trolley car 512 and 511 may be heading to St. Louis as part of a new heritage streetcar project. Transferring them to the St. Louis project would put them in daily use on a new heritage streetcar line that is a centerpiece of revitalization efforts for St. Louis’ Loop Business District. If the board approves the transfer, it also provides other benefits to TriMet. TriMet will repurpose the Trolley Barn maintenance facility into a MAX Maintenance of Way (MOW) facility to improve maintenance and response time for crews. Current MOW crews who do much of their work in central Portland would report to this repurposed facility, rather than being based out of facilities in Gresham and Beaverton. 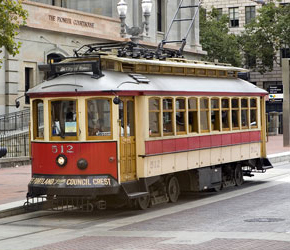 The Loop Trolley would pay for all of the costs to transport Vintage Trolley cars 511 and 512. As the MAX light rail system continued to expand, it limited the frequency of trolley service. Since 2011, Vintage Trolleys have operated along the Portland Transit Mall about eight days a year: Sundays closest to Memorial Day, July 4 and Labor Day, plus Sundays between Thanksgiving and Christmas. If the transfer is approved, the vehicles would move to St. Louis in mid-2014, so riders will still be able to take a few more trips before then. Vintage Trolley cars 513 and 514 are dedicated to service on the Willamette Shore Line. As federal funds helped to purchase the original cars, the Federal Transit Administration (FTA) is required to approve the transfer. FTA has committed $25 million to the Loop Trolley project.